I wanted to make a simple wrap dress with a top I could adjust for nursing my baby. It’s so hard to find dresses one can wear while one is nursing . I love to wear dresses and this design actually is not a true wrap dress, but unties and partially opens at the bust area. If you reinforce the neckline with elastic you can pull it down for nursing without pulling the v neck out of shape. The dress below is a size 10 and I slashed the pattern at the bustline to accommodate my larger than normal nursing bustline, ahem! Needless to say it looks a lot better on my dress form than me. My dressform hasn’t had four babies. 2. Ignore the measurements on the pattern envelope. This pattern runs about a size too big. There is nothing more annoying than cutting out an entire pattern based on your true measurements and the pattern specifications and then stitching up the pattern to find that it is huge. 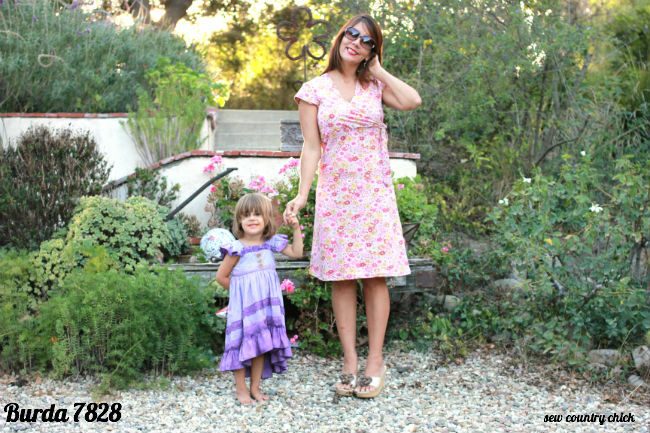 In short, this is a great little summer dress and a very easy pattern to follow. I like this dress – now that it’s getting hot again in Ventura County maybe I should try it out. The green print is really pretty!